WINTER 2019 CATCH-UP AND NEWS! There are a few exciting things coming up in April and May! Unicorn Dance Party at Platform’s Play Cafe on 17 April: Ruxy and Sarah Rose will be shaking their tails with little unicorns aged 0-5 and their families at Platform’s weekly event Play cafe. Platform is an amazing venue serving the community of Easterhouse and supporting artists of all disciplines in creating new work. THE GRAND REOPENING OF BRODICK CASTLE on the Isle of Arran on 4-6 May: Ruxy will be playing Princess Marie in the interactive, informative, and audience engaging events of the reopening celebrations at Brodick Castle, made possible by the National Trust for Scotland, where Ruxy holds membership. It will be fancy, it will be fun, and it will show you the life of the Scottish aristocrats and royal family back in the day. More about Tales from Brodick here. And here’s what happened in the winter! Ruxy at Ormidale House at SURGE's Established Artist Residency with Sarah Rose Graber (not pictured) to develop "Two in a Barrel"
AUTUMN 2018 CATCH-UP AND NEWS! OK! No news is good news, right? It’s been a busy Fall, but here’s a lowdown of what’s coming and what Ruxy has been up to! - The Power of the Possible Outdoor Arts UK Event in Glasgow on 22 November, 2018: an event co-sponsored by Creative Scotland, Glasgow Life and Merchant City Festival, and co-organised by Articulation, SURGE, and Outdoor Arts UK. This is an opportunity to meet people in the business and show a bit of work. Ruxy and creative partner Sarah Rose Graber were invited to do a pitch about their show The Dirty Laundry Campaign. Ruxy will pitch in front of outdoor arts delegates, curators, programmers, and other fellow artists, on behalf of herself and Sarah Rose (and of course Edward and George!). Looking forward to having this opportunity to be seen and meet other folk in the UK outdoors scene! - Clown Symposium at Edge Hill University, North England on 30 November and 1 December, 2018: Ruxy will attend the Clown Symposium organised by the Uni and led by Ronlin Foreman, one of Ruxy’s mentors and teachers from Dell’Arte International. - Green Arts Conference Culture Change: Ruxy attended this Creative Carbon Scotland-organised conference that asked the question - how to involve artists in the fight against climate change? A call to action and a wonderful group of dedicated people. - Virtualogue: Ruxy was invited to attend this 2-day SURGE event, which aimed to put together digital artists, technicians with performers and theatre makers. What is the future of theatre performance and does it involve the amazing technology available and being developed today? Can we incorporate Virtual and Augmented Realities into theatre-making and performance? We experimented with a few things, including VR sets and green screens. Met some amazingly talented people! Thank you, SURGE! - At Your Leisure Open Day The Refs performance: The Refs, Ruxy and Sarah Rose’s outdoor walk-about performance with two silly referee characters, was invited to perform at the At Your Leisure Festival’s Open Day on 3 November, 2018. This festival, partly organised and curated by young people, held its first edition in Musselburgh (Edinburgh) and was sponsored by Creative Scotland and Year of Young People Fund. 2018 was declared year of young people in Scotland - this festival was one of many initiatives to empower and encourage young people to make and organise events in the cultural and public sectors. Ruxy and Andrew Simpson performed on this day - they interacted with kids and their families and dished out many yellow and red cards! - Loads of teaching: Ruxy has taught in a number of projects this autumn, including First Nights with National Theatre of Scotland during their co-production of Cyrano (a project meant to bring theatre workshops/talks and play viewings to old and young folk alike who have never been to the theatre before, Glasgow and Edinburgh); Capall Dorcha Theatre Company in Ayr (drama taster workshops in schools and as the Physical Theatre Practitioner for the company’s youth production of a Halloween Show); Scottish Youth Theatre (cover classes), and training with NHS Forth Valley for their Max in the Middle Programme as a movement specialist (week-long workshops brought to 10 year-olds in schools across the East Coast of Scotland that include movement and drama to promote health and wellbeing). 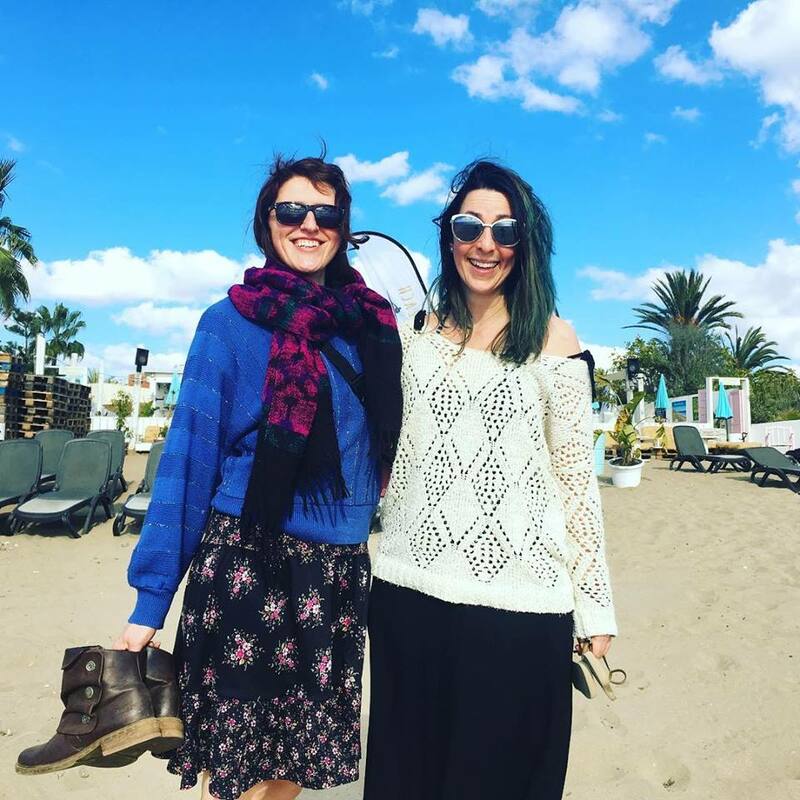 - The Refs 24-28 September, 2018: after receiving the ScotRail Foundation/Foundation Scotland Cultural Arts Fund, Ruxy and Sarah Rose created and performed this new piece of outdoor walk-about theatre about travel safety. 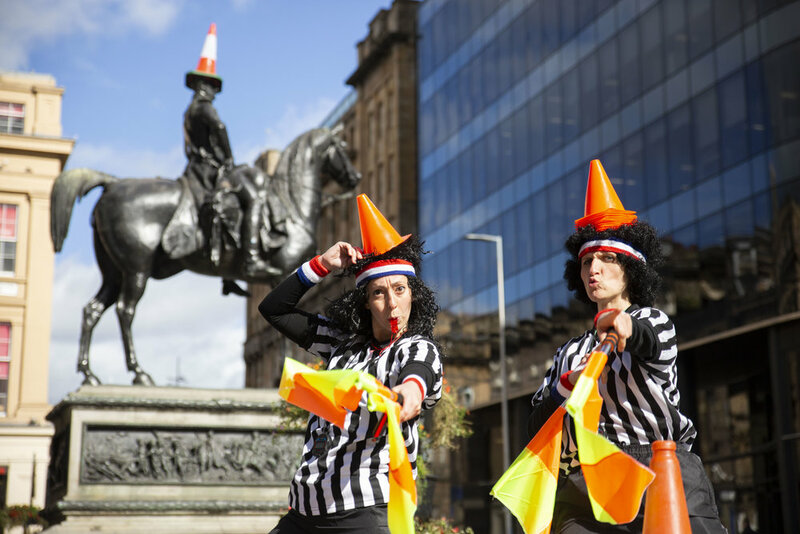 The two silly referee characters engaged Glasgow passers-by in playful competition, intense high-fives, and dished out quite a few yellow and red cards (even to each other!). We partnered up with City Sightseeing Glasgow - a wonderful team of people without whose support these performances wouldn’t have been possible. CSG offered us space to change into our costumes, took professional photos of our act, and put us in contact with a few important tourist spots in Glasgow, including Riverside Museum of Transport, The Tall Ship at Riverside, and the Willow Tea Rooms. We performed in all these wonderful places, in addition to Buchanan pedestrian Street in Glasgow, and George Square at Stop 1 on the City Sightseeing Glasgow Route. - Wild Journey Solo with Imaginate on 29-31 August, 2018: Ruxy was selected to attend Wild Journey Solo - a 3-day trek out to the Isle of Mull in the West of Scotland with other theatre practitioners. The objective was to disconnect and reflect in the middle of nature. 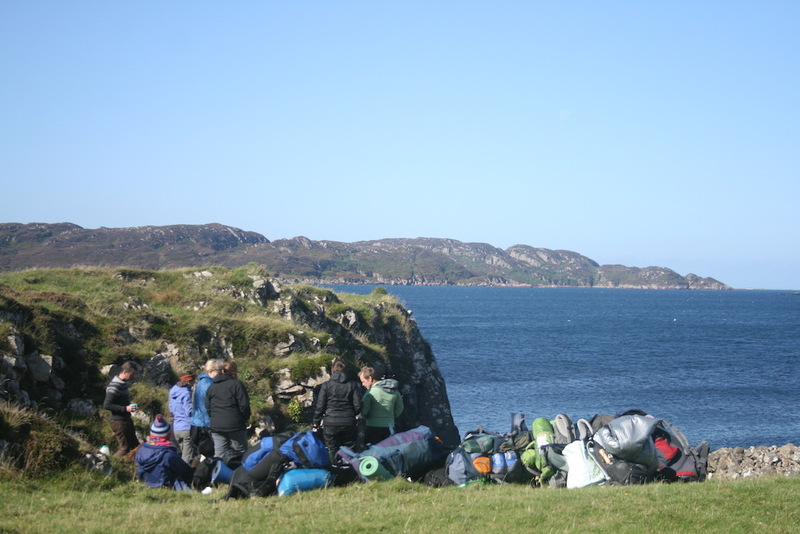 Elements of the journey were in a group setting, but an essential part of it was to spend 24 hours alone and isolated from the group, in a tent by the sea. An amazing experience! Grounding and purifying! Thank you, Imaginate, you are wonderful! - SURGE Pitch Cabaret at the SURGE Festival 2018: Ruxy was invited to present a work-in-progress piece at this event. The act she presented, entitled Unnatural Wish, was an excerpt from her solo show, Pickled Republic. SUMMER 2018 CATCH-UP AND NEWS! We've had a busy summer! With lots of sun! Ruxy and creative partner Sarah Rose Graber were invited to perform The Dirty Laundry Campaign at SOLAS Fest 2018 in Perth, Scotland, as well as at the Coliseum at Pianodrome event during Edinburgh Fringe 2018. The latter event, organised by Dylan Read, was held in a geodesic dome made of upcycled pianos and was among the top most exciting new venues at the Fringe this year. We are grateful for the opportunity to have shared our Polka dot-Stripe rivarly in the round - a gladiator-like setting in which Edward Aurelius Stripe and George Dottington felt most at home. Sarah Rose and Ruxy are also happy to announce that they are the proud recipients of the ScotRail Cultural and Arts Fund! 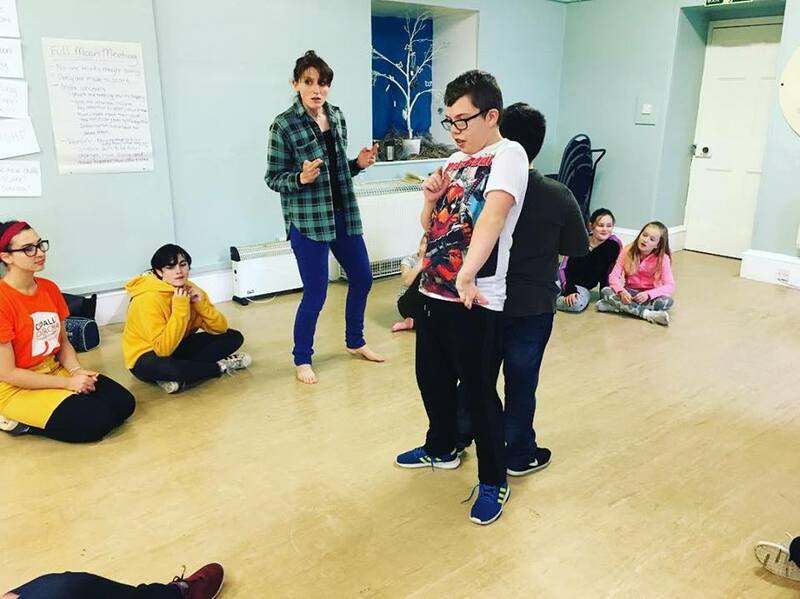 Sponsored by Foundation Scotland, this grant will allow Ruxy and SRG to create a walk-about piece of theatre that aims to engage the community at large around the theme of travel safety. The piece, called THE REFS, will be presented between 24 and 28 September in George Square and Buchanan Street in Glasgow, Scotland. A big thanks to ScotRail for their excited support! COMING UP IN MAY 2018... AND BEYOND! Ruxy and collaborator Sarah Rose Graber are invited to perform The Dirty Laundry Campaign at the Opening Weekend of Imaginate Festival - Edinburgh's International Children's Festival. We've adapted the show for young audiences for this occasion and we are delighted to be at the National Museum of Scotland to share our Polka Dot - Striped rivalry. 27 May - Edinburgh National Museum of Scotland - 11:15, 12:45, 14:45, 15:45 - Free Entry! MEANWHILE! Ruxy and Dylan Read have teamed up to work on Ruxy's Pickled Republic to finish developing the solo piece. Dylan is a Lecoq graduate, a consummate performer, and a talented deviser. He is contributing as an outside eye and fellow deviser on the piece. Many bows of gratitude to you, Dyl! ALSO! Stay tuned for some exciting new announcements about a new outdoor piece and a new grant notification. Ruxy will be performing at Clown Cabaret Special Edition at manipulate Festival 2018 in Edinburgh. Check it out here! Come laugh with us! As the recipient of one of the first two Clown Cabaret Scratch Night Bursaries, Ruxy will be taking two of her clown acts to the Red Pearl Women's Clown Festival in Helsinki, Finland! Check out the festival here. A bow of gratitude to Clown Cabaret Scratch Night - Tim Licata, Melanie Jordan, and Saras Feijoo! Winters are hard in Scotland, so we shake a leg to stay warm! OCTOBER - DECEMBER 2017: Ruxy is on the Betty Bus! With Research and Development for Pickled Horatio done (trailer here), Ruxy visited Germany for an outstanding Alexander Technique retreat here. But the bulk of the Fall was spent on the Betty Bus Tour. Ruxy was part of the 7-person team on the Betty Bus (ball pit) - an initiative by Betty For Schools to bring period education to schools all across the UK. For 7 weeks, Ruxy co-led interactive, theatre workshop-style sessions to young girls talking openly and freely about periods, looking to debunk myths and break down barriers of shame surrounding the subject. We travelled to Birmingham, Bristol, Plymouth, Exeter, and London, to name just a few locations on our touring schedule. I liked the betty bus because it made me feel more confident. The experience has been fun. I now know what to do. I loved it! It's perfectly natural! I like how the people didn't make us uncomfortable! More info on this beautiful project here. Proud and grateful to have been part of it. Thanks Betty and EdComs! SEPTEMBER 2017: Ruxy and fellow physical theatre maker Melanie Jordan are undergoing a three-week Research & Development period on their double bill of solo shows entitled Pickled Horatio. This project, supported by Creative Scotland, will culminate with a work-in-progress showing at Assembly Roxy in Edinburgh on 27 September, 2017. Ruxy's solo show is called Pickled Republic, Mel's - Ho! Horatio! and the two Glasgow-based artists are aiming to have an hour-long double bill by Summer 2018. The R&D team included: Alan Richardson as Director, Alberto Santos Bellido as Lighting Designer, Alice Gooden as Set/Costume Designer and Props, Susan Bear as Sound Designer, Eileen Wilson Kerr as Producer, Rosie Ward as Stage Manager, and Caitlin Skinner as Creative Response Process Facilitator at the Feedback Session. Video by Bevis Evans-Teusch, and Photos by Jassie Earl. Watch this space for upcoming info on this project. SUMMER 2017: Ruxy and Sarah Rose Graber continue campaigning for Stripes and Polka Dots! Ruxy and Sarah Rose Graber had a summer-full of performances with The Dirty Laundry Campaign. The ridiculous street performance played at Edinburgh Fringe on the Royal Mile Street Theatre Events in August, at SURGE and Merchant City Festival in Glasgow on 29 and 30 July in Glasgow, Scotland, SOLAS Festival in Perth in June 2017 and at Physical Fest's Street Theatre Day in Liverpool in May 2017. The DLC performed for the first time, in scratch form, on 13 May in Edinburgh at SURGE's Pitch Event. Follow what politicians George Dottington and Edward Stripe are up to HERE! Ruxy and Sarah Rose received a street theatre bursary from SURGE and support from Creative Scotland, making all of this possible. Thank you, SURGE and Creative Scotland! This show is now available for booking. Please visit our Facebook Page or the SHOWS heading on this wesbite for more info on how to book and to see our trailer and Photo Album. a few streets away a couple of gung-ho politicians are clowning around in pursuit of our votes, their Dirty Laundry Campaign full of Trump-ed up handshakes and ever-lengthening ties. A few days later, Ruxy presented the same piece at Tron Theatre's curated Outside Eyes event and the Worker's Theatre Weekender Cabaret at Glad Cafe, Glasgow. Thank you, Tron Theatre, Michael O'Neill, and Thank you Workers' Theatre for the opportunity to PLAY! Ruxy was invited by the Theatre Department from her alma mater to teach part of the Acting IV course - the most advanced Acting course available at Furman. Ruxy introduced the 11 students to physical comedy and Clown, thus completing the course that had been guest taught by 3 guest artists prior to Ruxy's module: Doug Berky (mime), Stephen Tyler Davis (Bunraku puppets), and Randall David Cook (playwriting). Abundant thanks to Maegan McNerney Azar - Acting Faculty at Furman, Jay Oney - Head of the Theatre Department at Furman, the entire Furman Theatre Department, and Barbara and Don Pierce who hosted Ruxy during her tenure at Furman. It was great being back at Furman University, this time around as a teacher. Thank you, Furman! You are lovely in the spring. 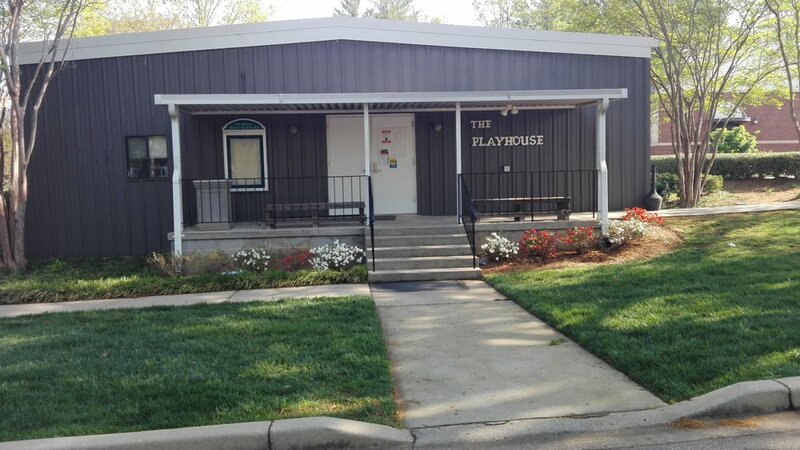 Check out the dedicated work of Furman Theatre here. Gregor has made a new appearance, this time around with some introspection. For the first time ever, he begins to doubt his ability to reach the top of Everest. A pathetic display of emotional self-doubt in Passion of the Gregor. AND! Ruxy joins fellow Scottish physical theatre artist Sita Pieraccini in creating a Mask piece titled Lucent. We were interested in exploring what a mask could be - Sita creating an elaborate headpiece out of coat hangers, and Ruxy eager to play in something that abolishes the human form. The result - an "oddly compelling" atmospheric, and bizarre 10-minute piece about the random, yet welcome, moments of recognition between strangers. Ruxy spent 2 weeks and a half in New Orleans with Darci Fulcher - also a Dell'Arte M.F.A. graduate. The two focused on developing Pickled Republic - Ruxy's newest solo performance. Darci helped shape the existing material, devise new one, direct the piece, and produce a work-in-progress showing at the Fortress of Lushington in the French Quarter of New Orleans. This marked the second stage of development of the piece, and a wonderful one at that - Darci and Ruxy have worked together several times before, have similar artistic inclinations and vocabulary, and have wild fun creating together. In addition to Pickled, Darci and Ruxy worked on a solo, short clown-inspired bit to be performed by Darci entitled Jitterbug Heart. The short piece was played as an opener to the Pickled Republic showing on November 20 at the Fortress of Lushington. The two also led a workshop together for up-and-coming NOLA comedic performers titled The Complicite of Clown. Beyond having the wonderful opportunity to work with Darci and present work in front of an audience for feedback, this visit opened up opportunities for further collaboration with New Orleans theatre makers. The work wouldn't have been possible without the support of Goat in the Road Productions (of which Darci is a member), specifically Shannon Flaherty and Chris Kaminstein, or Bunny Lushington at the Fortress of Lushington. And, a special nod to Christopher Kehoe (Dell'Arte M.F.A 2015) who provided a much-needed perspective and support in the rehearsal studio and in the days leading up to the showing. A big Thank You to all you guys! The Clown Cabaret came back with a vengeance, this time at the Tron Theatre in Glasgow, and played for three nights in a row! This bi-annual event has a loyal following in Scotland and always delivers the funny. This time around, Ruxy presented Bête Noire - a short, word-less piece featuring Parr, an alien-like, fear-ridden creature. You can find a lovely review on Parr and the show here, written by Scottish theatre reviewer Lorna Irvine. Clown Cabaret Scratch Night is run by Saras Feijoo, Melanie Jordan and Tim Licata. This collaboration between Plutot La Vie Theatre Company and Clownstepping is generously supported by Creative Scotland. For more info about CCSN, the people who run it, the acts, and future auditions, click here. SEPTEMBER 15, 2016: Ruxy appears on the Late Show on STV Edinburgh and Glasgow! 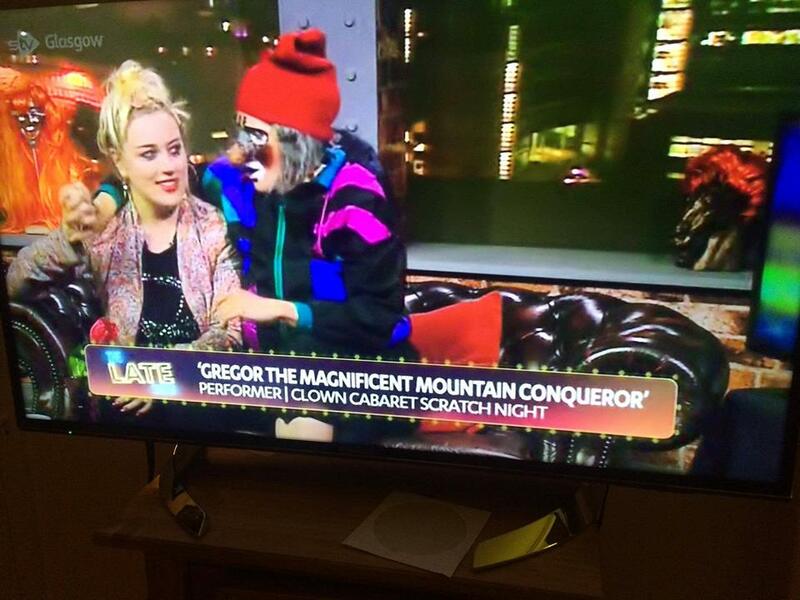 Gregor, the Magnificent Mountain Conqueror stopped by the set of The Late Show - Scotland's first and only late night talk show - to chat about his adventures and to inform the public about the upcoming Clown Cabaret Scratch Night. Gregor got down and dropped some science on the host and his guest about the nature of badassery. He also flirted a little. Link to the show here, unfortunately only available to view in the UK. The Late Show is Scotland’s first ever late night chat show. It broadcasts across the Central Belt of Scotland to over 3 million homes on Freeview 23, Sky 117 and Virgin 159. It airs on both STV Glasgow and STV Edinburgh and is hosted by Ewen Cameron. Ruxy performed in an outdoor street theatre piece entitled Illegal Alien, commissioned by Conflux and conceived by Bob Moyler. This satirical street chase of alien enforcement saw the furry alien roam the streets of Glasgow Merchant City and Ruxy as the airhorn-wielding law enforcer. You can find some lovely photos of the act here, courtesy of Kevin Curtis. ALSO! Gregor attempted another Everest ascent at SURGE's Clown Cabaret Scratch Night that took place at Tron Theatre in Glasgow. Ruxy was invited to take part in this best-in-show special edition Clown Cabaret along with 7 other Scottish clowns. SURGE is Scotland’s annual festival of street arts, physical theatre and circus. Delivered in partnership with Conflux and Merchant City Festival, the fest fills the streets and spaces of Glasgow with exciting new Scottish work and cutting edge international performance every July. Read more about SURGE and Conflux, its parent organization, here. JULY 3-10, 2016: Ruxy attends and performs at Mirabilia Festival in Italy as part of the Focus Scotland Program. A great time was had by all, tremendously enriching and creatively widening. I am proud to be part of such a supportive community of artists in Scotland. Many thanks to Alex McCabe and Aerial Edge who made this possible. JUNE 25, 2016: Ruxy performs at Bouffon Scratchings in Edinburgh with fellow physical theatre artist Sita Pieraccini! Ruxy and Sita create and perform a bouffon piece entitled I am are ART at the first ever edition of Bouffon Scratchings. This event was curated and produced by the Clown Cabaret Scratch Night Team - the lovely Melanie Jordan, Tim Licata of Plutot la Vie and CloWnStePPinG. This decadently fun adventure marks the first time Ruxy and Sita collaborate, but definitely not the last! A big THANK YOU to the organizing team, the flock of bouffons, Alberto, and a wonderful audience at Assembly Roxy in Edinburgh! Photos from the event HERE courtesy of Rich Dyson Photography; and stay up-to-date with the bouffons HERE! APRIL 9, 2016: Ruxy performs as Gregor the Climber at the Edinburgh Clown Cabaret Scratch Night to a packed house! What more can I say? Great fun, Great audience! Gregor dazzles Edinburgh-ian audiences for the first time! This event was organized and curated by Plutot La Vie, CloWnStePPinG, and Melanie Jordan who offered advice, organizational support, and even funding (courtesy of Creative Scotland)! THANK YOU! Gregor will attempt another Everest climb in late July at the Surge festival in Glasgow. Watch out for announcements soon! Ruxy was accepted to be one of 12 artists in CONFLUX's first ever Established Artist Residency - a week-end retreat for local established artists in rural Scotland aimed at providing a platform for research and development of creative projects. Led and facilitated by Scottish acclaimed theatre maker Hilary Westlake, the Residency consisted of group and one-on-one discussions with fellow artists from various disciplines - sound design, animation, dance, theatre, music composition, and writing. Ruxy focused on developing Pickled Republic (based on feedback from PITCH, see below) and benefited from advice from sound designers and devisers, in particular. This was a great opportunity to talk through ideas, clarify vision, and articulate direction. 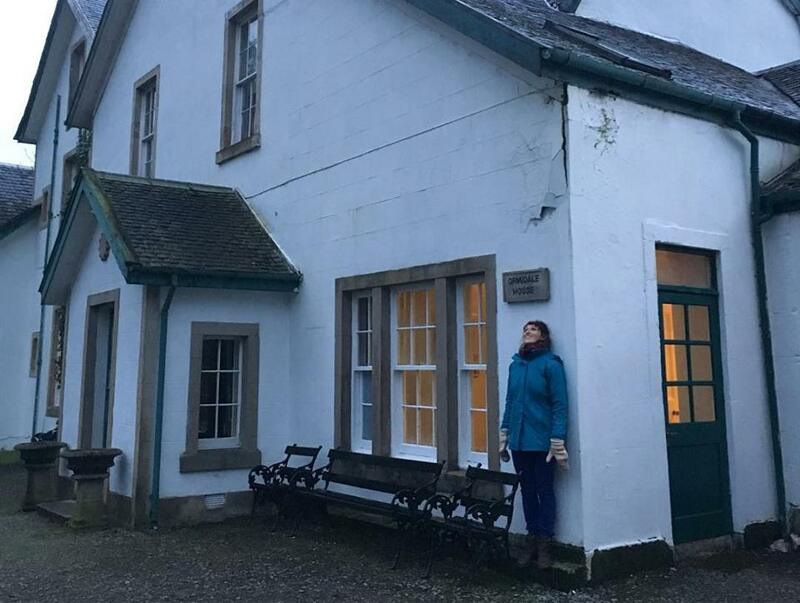 The Residency was set in Ormidale, rural Scotland, North East of Glasgow, in a beautiful Victorian House which facilitated focused discussions, presentations, delicious meals, and raucous meetings of minds. THANK YOU, Alan, Hilary, Ormidale House, CONFLUX, and all artists at the residency! All of it was amazing but the transformation into the ‘Moldovan’ old lady was incredible. Great physical expression! I thought there was a fantastic timing – and each moment came from a stimulus. Very engaging performance. The character was superbly constructed. And Thank you Alan Richardson, Eileen Wilson, Eve Nicole, and CONFLUX in general! Pickled Republic is a solo show Ruxy is currently working on. There will be other work-in-progress showings coming up in the next few months. Details on what it's about are below, under the January 31 entry. Ruxy was accepted to perform at Conflux's quarterly cabaret event on March 10 at CCA Glasgow! She will be performing all new original material (work-in-progress) from her upcoming solo show Pickled Republic. Info and tickets on the poster (that's me on the poster!!!) to the right. Conflux runs projects to develop street arts, physical theatre and circus in Scotland. More info on this organization here. Pickled Republic is a one-woman storytelling and physical theatre piece (new work-in-progress) that brings to life the paradoxes and unexpected transformations that come about from living in Eastern Europe. Inspired by the peculiar and altogether startling changes the body of a Moldovan woman undergoes once she crosses the threshold of 50 years of age, the story navigates through a grotesque and absurd world where people "pickle" themselves, or go through varied extreme manifestations of themselves, to survive. Using elements of Bouffon, Vaudeville, and Clown, this story ultimately inspires us to consider the nature of our identity - who we are, who we want to become, and what eventually catches up with us. NOVEMBER 26, 2015: Ruxy moves to Glasgow, Scotland!! Ruxy is now based in Glasgow, Scotland for the next 6 months (at least). She is currently looking for performance and collaboration opportunities in Scotland, while working on a solo Physical Comedy/Storytelling piece inspired by the paradoxes of Moldova entitled Pickled Republic. She has already taken part in a one-week intense training session with Company of Wolves - a laboratory theatre company based in Glasgow who devise their own work, using elements of theatre, dance, music, and improvisation - where she had the lovely opportunity of meeting local fellow devisers and theatre artists. Instant Acts is a project by Inter Kunst, this year in its 22nd year, that gathers artists from all around the world to tour schools and youth prisons in Germany and Northern Italy. 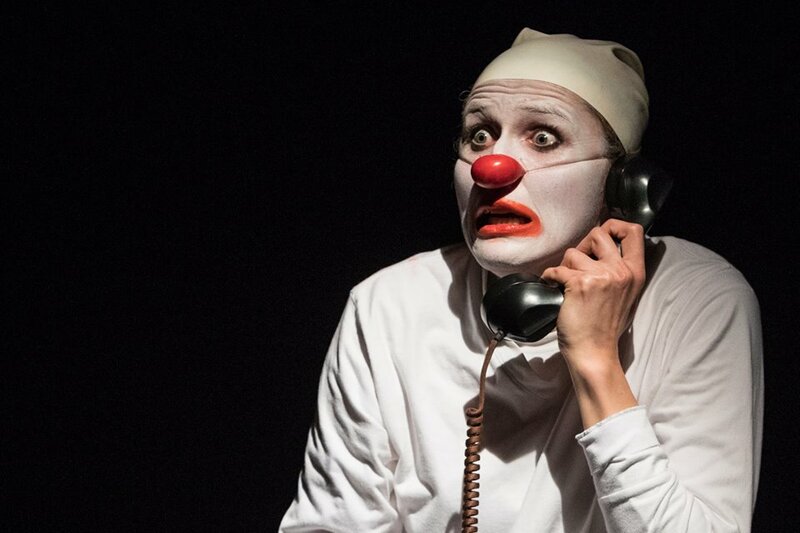 This year, Ruxy joins artists from Poland, Croatia, Burkina Faso, France, Spain, Nigeria, Germany, Iran, and the Czech Republic as a Clown and teacher of Physical Comedy workshops. For more info on the project, click Here. Or take a look at our tour schedule HERE. Photos to the right courtesy of Alice End Photography & Media Design, SIlvia Kofler, and Instant Acts Cast mates. 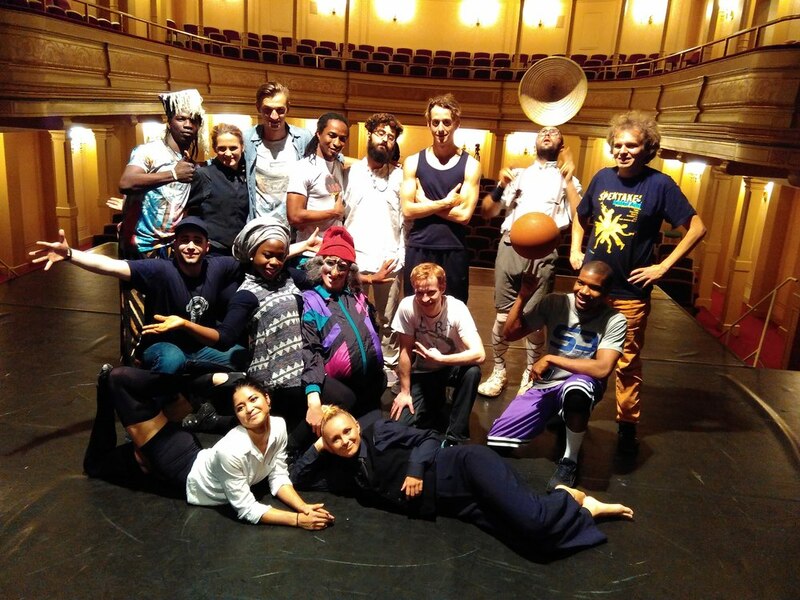 Ruxy spent over a month in Berlin training in Biomechanics, Mime, and Movement at the Bewegungs Training at the Mime Centrum in Berlin, where she also met with locally-based artists. She met with Dell'Arte Alumni Susanne Becker and Daniel Megnet, who taught her how to stilt walk. Daniel also put her in contact with the weekly Clown training at Zirkus Zack, where she taught a workshop. Anne as Mulli in "Get Back on the Horse"
Over her 2-month stay in Copenhagen, Ruxy cultivated a working relationship with Anne Kjaer Waehrens, Dell'Arte Alumna (PTP 2010). Ruxy provided feedback and was an outside eye for Anne's solo clown piece Get Back on the Horse. 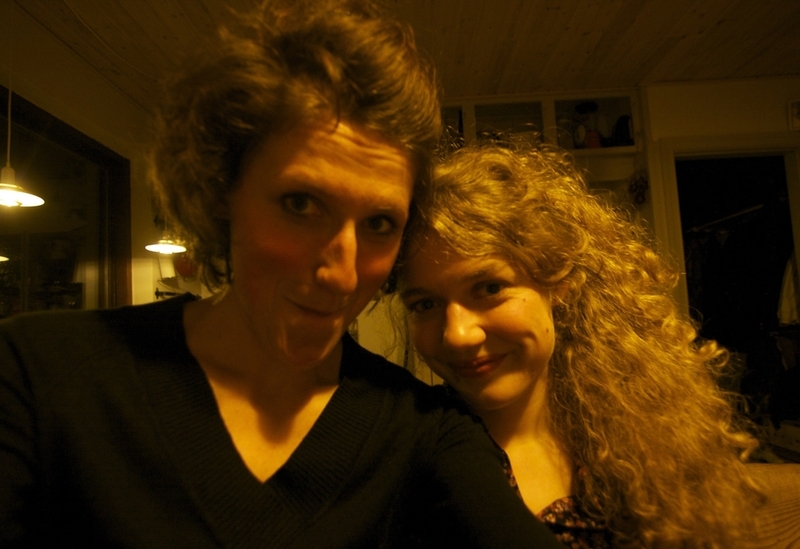 Ruxy accompanied Anne as (tech) support to Fyn, Denmark, where she performed her piece at a Theatre Festival for Youth. The two later created a 10-minute comedic duo piece that they performed at AFUK Academy for Untamed Creativity in Copenhagen at a work-in-progress event. The next project they are planning on diving in together is an original piece inspired by Cleo de Merode and Simone de Beauvoir and the feud between them. This is an idea conceived by Anne and the project is now in its initial research phase. FEBRUARY 4, 2015: In the market for a new home base! Ruxy sets off on a European exploration/networking trip to find a base. Her first pit stop is Copenhagen, Denmark! JANUARY 15-21, 2015: Ruxy welcomes fellow artist and collaborator Zuzka Sabata to Moldova. 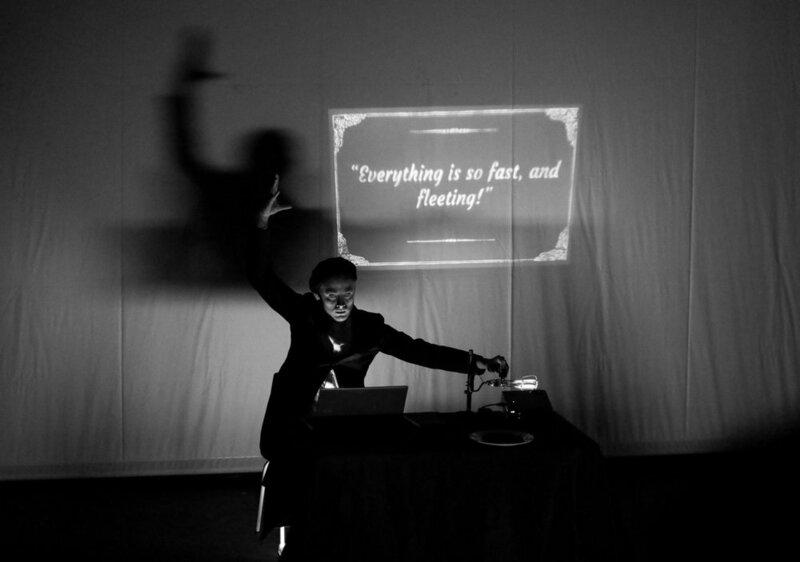 Originally one of Ruxy's teachers at Dell'Arte in her first year of MFA, Zuzka collaborated with Ruxy on a couple of Dell'Arte Company productions, including Comedy of Errors (2013). In 2014, they created a comedic duo named Vlasta and Vlagila and premiered their Cactus Talk at the Red Light Cabaret (Dell'Arte's Mad River Festival) to an uproarious packed house. Zuzka's visit to Moldova saw them solidifying their act, collaborating and advising on each other's solo work, and planning their next creative endeavor together that is likely to happen in Moldova in 2016. Perhaps under the heading - The Moldovan Dream. Ruxy and Zuzka also met with other Moldovan theatre artists, like renowned theatre director Mihai Fusu, and traveled to rural Moldova to visit Ruxy's grandmother. DECEMBER 22, 2014: Ruxy is invited to lead a Bouffon and Theatre of the Grotesque workshop at FOOSBOOK - Theatre Laboratory (Chisinau, Moldova)! The workshop was open to all interested folks and was a great success. Take a look at what JurnalTV - one of the most respected TV stations in Moldova - had to say about it and Ruxy (Romanian) HERE. Also check out the event's Facebook page here. More workshops in collaboration with FOOSBOOK will take place in January. Check back here soon! NOVEMBER 26, 2014: Ruxy led Physical Theatre and Movement workshops with the Year One Acting Students for a month at the Moldovan Academy of Art, Music, and Theatre which culminated in a Performance Lab open to the public. It was a superb experience! I managed to find the real fire within me! The workshops with Ruxy helped us become more free, more focused, and more ingenious. This workshop was a big challenge for me, but I accepted it wholeheartedly. I started wanting to discover things I hadn't known before. I understood what movement, space, and stage presence are... This workshop taught me to say YES to proposals, to accept them. Thanks to this experience, I learned how important it is to listen to one another and to accept one another. July 2014: World premiere of Elisabeth's Book at Dell'Arte's Mad River Festival! This international collaboration was conceived by Joan Schirle and directed by Alain Schons. Devised and performed by Joan Schirle, Laura Munoz, and Ruxy. Elisabeth's Book tells the story of three women who survive in the face of adversity because of their friendship and the act of creation. May 15, 2014: The Dell'Arte 2014 Thesis Festival opens! Ruxy is invited to participate in the thesis of Darci Fulcher, Billy Higgins, and Jerome Yorke (all M.F.A. 2014) with Grace Booth (M.F.A. 2016). Through the Seams was called by Ronlin Foreman "a Genesis bomb compounding of one thing into another" and "a pure state of theatre ...[which] referenced its own sphere of reality." 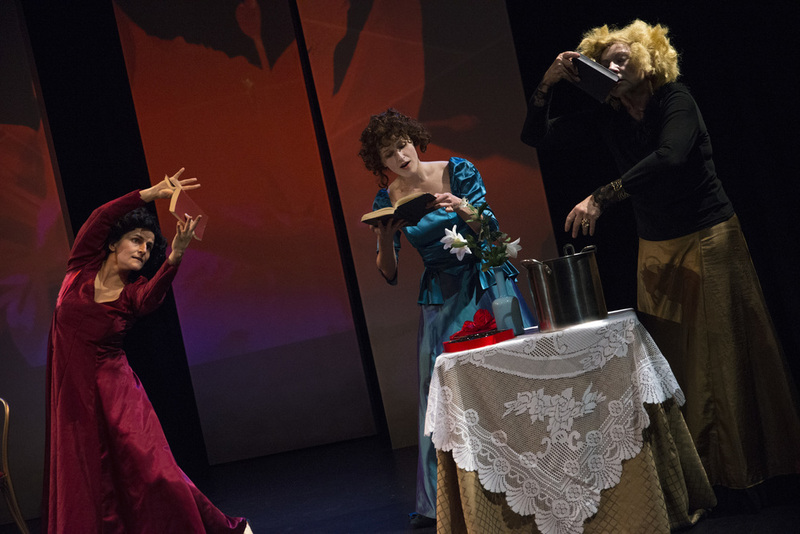 Through the Seams is an image-rich, no-word physical theatre piece that explores what it means to live with free will. A man pulls a rope through territories where people play out their cycles of penance, a woman soaking wet wanders through the front door while a drip in someone's attic predicts the oncoming flood. This is no ordinary world - the man's rope reaches around several Earths and the scream of despair uttered at one end of the world is heard across dimensions. We rarely carry our suffering with dignity; most of the time we dance to its tango with abandon until we are consumed. Through the Seams journeys through the hidden realms of human suffering and attempts to manifest that which cannot be said, but felt in the darkest depths of our being.